You can easily make the coconut and lemongrass curry paste in advance to halve the cooking time of this recipe, making it a speedy midweek meal. Heat a large frying pan or wok over a medium-high heat and, when hot, briefly toast the coconut flakes, then set aside. In a food processor (or using a pestle and mortar), whizz/grind two thirds of the coconut flakes with the ginger, lemongrass, chilli and a splash of water to make a thick paste. Boil a pan of water and cook the noodles accordingto the pack instructions (about 5 minutes). Rinse under cold water, drain, then set aside. Heat 1½ tbsp rapeseed oil in a frying pan or wok overa medium-high heat. Add the chicken and fry for 1-2 minutes on each side to brown, then turn the heat down to medium. Add the curry paste and mix well, then fry for 1 minute before adding the greens. 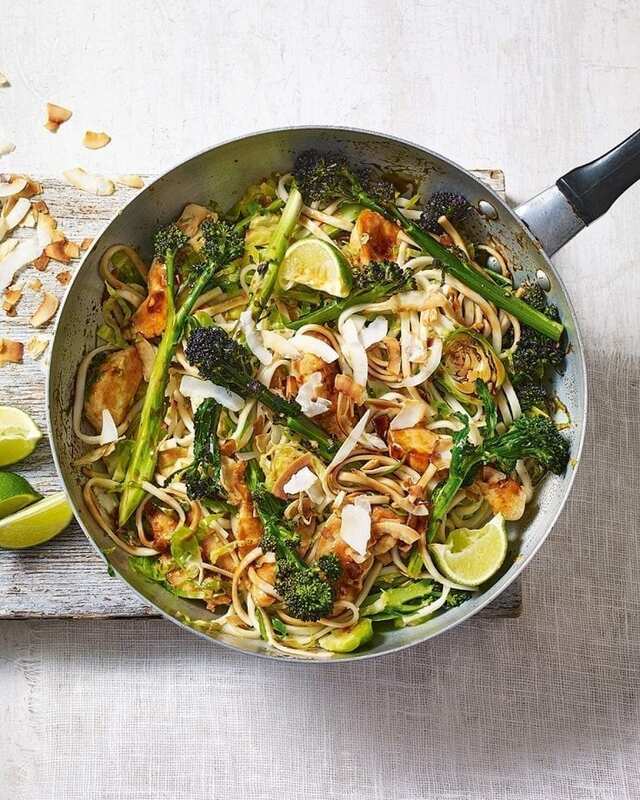 Cook the broccoli for 1 minute, then add the sprouts and noodles, toss well and stir-fry until heated through. Stir in the kecap manis, lime zest and juice, then serve with the remaining toasted coconut and the coriander. Add some oyster sauce with just a dash of soy to taste at step 4. Stir-fries are a great choice for healthy meals as it’s easy to add flavour using citrus, aromatic spices and soy sauce. Our quick homemade curry paste uses water instead of oil. Make the curry paste up to 48 hours ahead and keep covered in the fridge until ready to use.